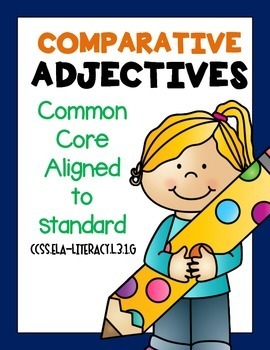 The Best of Teacher Entrepreneurs II: COMPARATIVE ADJECTIVES! Grade 3 Worksheets Common Core Aligned 23 Pages! COMPARATIVE ADJECTIVES! Grade 3 Worksheets Common Core Aligned 23 Pages! Grade 3 Worksheets Common Core Aligned 23 Pages! Can also be used for grades 2 and 4. 17 Fun Interactive Worksheets all on Comparative Adjectives!